Whipped up by Shiite Iran, the struggle for Syria has degraded into a Shiite holy war. Iranian, Iraqi and Lebanese Shiite fighters have been trickling into Syria for months. Effectively, their charge is to prevent the fall of Syrian President Bashar al-Assad, whose Alawite sect is an offshoot of Shiite Islam. But the “rallying banner” used for their recruitment is to protect the revered Sayyeda Zeinab shrine in Damascus. The longer the fighting continues in Syria, the greater the risk of exposing fault lines between Shiites and Sunnis in both Lebanon and Iraq. Whereas Iran is 90 percent Shiite, Syria is 75 percent Sunni and 10 percent Alawi-Shiite. In Lebanon, Muslims are very roughly divided into two quasi-equal Sunni and Shiite halves. Iraqi Muslims are two-thirds Shiite and one-third Sunni. Lebanese Hezbollah’s head-on plunge to fight alongside Assad forces against Syria’s Sunni rebels is increasingly radicalizing Lebanon’s Sunnis and threatening Lebanon’s own future. Hezbollah leader Hassan Nasrallah declared in a televised speech last week, "Syria has real friends who will not let it fall to the U.S., Israel or Islamic radicals". Hezbollah fighters are at the moment openly and freely waging war on Assad’s opponents in Qusayr, Homs and the suburbs of Damascus. They belong chiefly to the Abu-Fadl al-Abbas and Iraqi Hezbollah brigades, and Asa’ib Ahl al-Haq. Initially the only proof of a Lebanese or Iraqi Shiite fighter killed in Syria was the occasional hushed funeral. 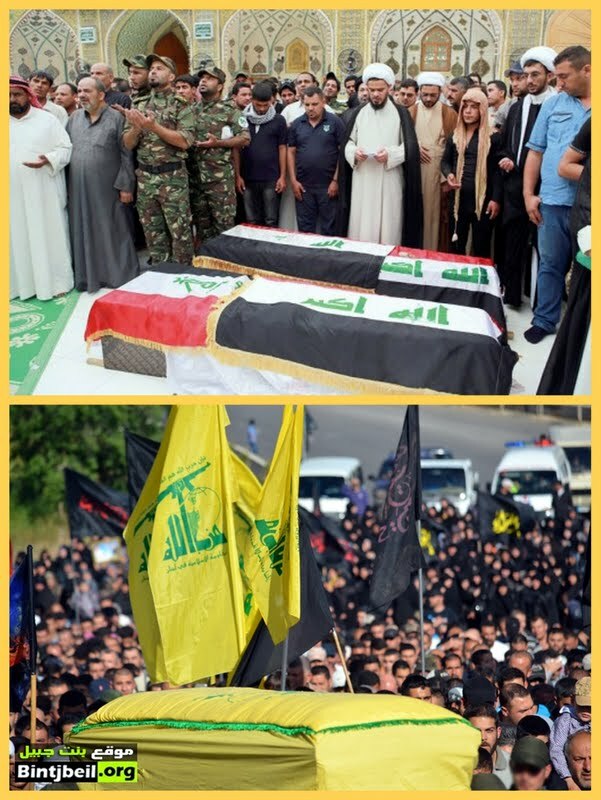 The funerals are now public and much more common in both Lebanon and Iraq. The latest, for two members of Asa’ib Ahl al-Haq who died in Syria, was held in Najaf earlier this week (see photo above). The Syria war is also fueling renewed Sunni-Shiite strife in Iraq, where sectarian violence is on the rise. Iraqi security forces used “disproportionate force,” including shooting unarmed civilians, during their raid on an encampment of Sunni protesters last week that left 45 people dead. The April 23 crackdown on Sunnis in the city of Hawija in Kirkuk province who were protesting against the Shiite-led Iraqi government of Prime Minister Nouri el-Maliki unleashed a backlash of deadly attacks by Sunnis and battles between gunmen and security forces that have claimed more than 250 lives. The unrest poses the most serious threat to Iraq's stability since the last American troops left in December 2011, and raises fears of a new phase of widespread sectarian fighting. A parliamentary committee probing what happened at Hawija found this week that 44 Sunnis were killed, along with one soldier. They were all killed by gunshots and ranged in age from 13 to 55 years old, according to the report. Seven of those killed were shot from behind, and five victims had bruises or other injuries in addition to the gunshot wounds, the report states. 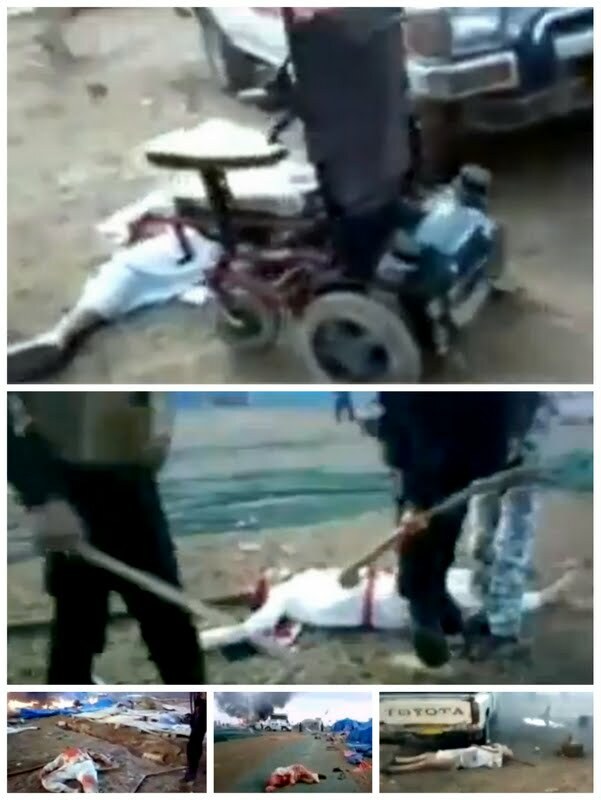 The parliamentary committee report indicates that “senior officials gave orders for army, federal police, and SWAT forces, all of which fall under Maliki's military office, to invade the demonstration site, remove demonstrators and level tents," according to Human Rights Watch. Witnesses told members of the parliamentary committee that at dawn on April 23, security forces sprayed demonstrators with hot water and threw sound and smoke bombs into the square. Black cars that federal police typically use for crowd dispersal and tanks invaded the square, “razing everything, including tents and cars,” the report quoted witnesses as saying. The report said some of the corpses also bore abrasions, fractures, and bruises consistent with beatings, and witnesses reported that security forces wearing black uniforms beat them with batons and fired on protesters with live rounds using automatic weapons. On the basis of these witness accounts and of interviews with members of parliament and local and federal government officials, the report concluded that 44 civilians were killed, including five children. The parliamentary committee gave Human Rights Watch photographs it says were taken of the victims in the attack’s immediate aftermath. The photographs show the corpses of several men lying in the area of Pride and Honor Square, amid flames and burning cars. Their hands are bound and they appear -- because of the way the bodies are positioned -- to have been executed with gunshots. Editorially, Egyptian political analyst Imad Adeeb, writing today for the leading Saudi daily Asharq Alawsat, believes Iraq is more high-risk than Syria. 1. Whereas the regime in Syria is aligned to Iran and Russia and standing on its last legs, Iraq has a government that makes common cause with Iran and is likely to stay. 2. In Syria, a sectarian regime is setting out. In Iraq, a sectarian regime is sinking roots and increasingly buoying up its sect on the home front and regionally. 3. Unlike Syria, Iraq is an oil-rich country par excellence. It recently made a major gas field discovery to boot. 4. Iraq reflects the failure of an American venture that cost Washington two trillion U.S. dollars. While it is difficult to imagine U.S. troops returning to Baghdad, Iranian intelligence services and Republican Guards are already having a field day in Iraq. Adeeb says, “This makes Iraq under the government of Maliki, and his political and sectarian alliances, pose the highest threat to the independence of a modern civil state in the Arab world.